Step right up to the black jack table and start planning for your casino themed party. Here you will find all of the card suit decorations and dealer costume accessories that you will need to make your event space look like it belongs in a casino on the Las Vegas Strip. 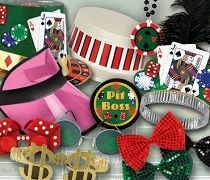 Deal a winning hand with the bulk casino night decorations and party supplies that are available from Party Express. A casino themed party is the perfect event for any type of party. It works best when the guests are adults, since they will have a better understanding of the casino theme. 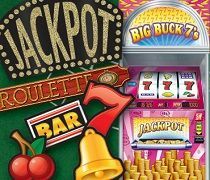 The casino theme is easy to achieve with the hundred of wholesale decorations that you will find here. Select some playing card centerpieces, and hand some playing card whirls from the ceiling to let your guests know that you plan on dealing them a great time. Then you can hand out some favors to all of your guests. Some great casino themed ideas include card suit boppers, realistic playing card favors, dice beads, or casino themed party hats. You also have to think about your servers as well. Turn your waitresses into casino cocktail servers and your bartenders into casino dealers. This can be achieved by giving your staff items like dealer visors, or dealer arm bands to wear for the evening. Have you servers dress in all black to resemble cocktail waitresses. Your guests will have a great time gambling with our fake money and $100 bills that they will think that they hit the jackpot. Give out prizes to those guests that win the most that evening. You can either have fun prizes, or high end prizes to give away. Either way your guests will have a great time partying the night away at your very own casino night.